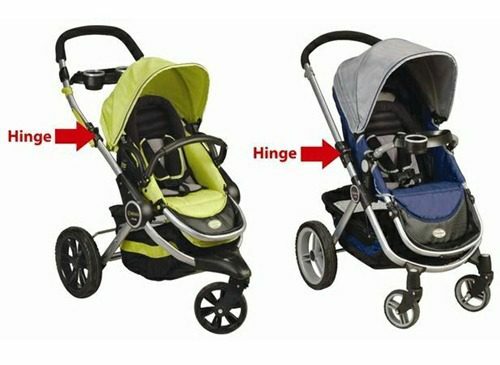 Approximately 36,000 strollers are being recalled in the United States, and another 270 in Canada, due to finger injuries. Kolcraft Enterprises Inc, of Chicago Ill, along with the US Consumer Product Safety Commission (CPSC) and Health Canada, announced the recall late last week. According to the announcement, the fingers of adults or children can be caught in the opening that is made when the hinge mechanism is being locked or unlocked. The mechanism is used to adjust the stroller’s handle bars. The announcement goes on to say that the CPSC and the company received reports of five injuries related to the strollers. Three of those involved children whose fingertips were amputated, two were adults whose fingers were smashed or cut. The recall involves Kolcraft Contours Options three and four wheeled strollers. An image of the strollers, as provided by the CPSC, is below. The model numbers on the recalled strollers start with ZL002, ZL005, ZL008, ZL015 and ZL018. The strollers were manufactured from January 2006 until November 2009 and came in a variety of colors. On the ZL002 model, the model number and manufacturing date is printed on a sticker above the left wheel. On the remaining models, the model number and manufacturing date is printed on a label sewn onto the edge of the back of the stroller seat pad.